St Fillan’s Holy Well at Kilallan, Renfrewshire, Scotland. OS Grid Reference: NS 38401 6899. The healing well of St Fillan lies at the edge of a wooded area 140 metres to the north-east of the ruined and roofless chapel, also named for the saint, at the east-side of Kilallan Farm, near the village of Kilmacolm in the parish of Houston, Renfrewshire. And 55 metres to the south of the holy well, beside Corsliehill Road, is the famous St Fillan’s Seat, a large rock shaped as such. St Fillan or Foelan was an 8th century saint from Munster in Ireland. The little hamlet of Kilallan (meaning the cell of Fillan) with its old ruined church of St Fillan and graveyard was a holy and sacred site and also a place of pilgrimage in the Middle Ages – as was the nearby holy well and rock-seat. The church was last used for services in the latter part of the 18th century. Although the church is without its roof it does still retain some interesting medieval features, and there used to be a 10th century stone here. The holy well, ruined chapel and stone seat lie just off Corsliehill Road in the vicinity of Kilallan Farm, some 2 miles to the south-east of Kilmacolm, near Houston. The holy well of St Fillan was almost certainly a pre-Christian spring that was used by the saint himself in the 8th century for baptismal purposes. 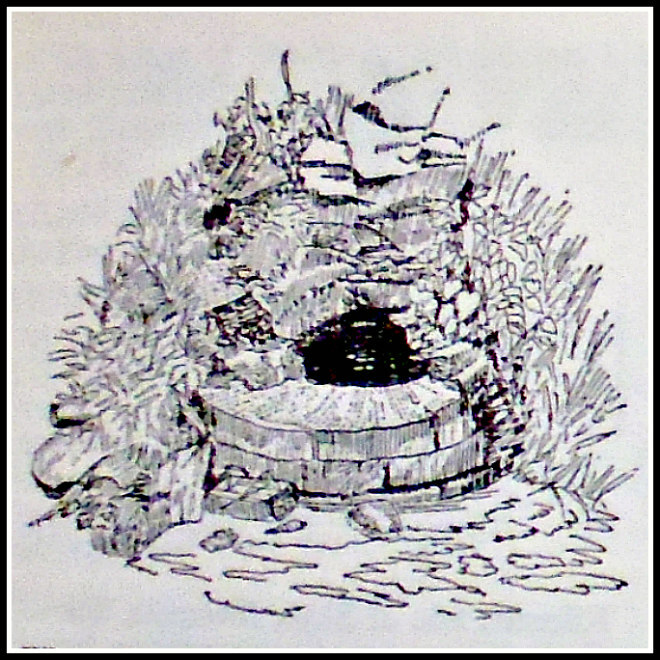 It’s water flowed from beneath a rock in the ground and into a round-shaped brick and stone basin. Long ago the holy water apparently miraculously cured children of rickets when they were bathed there; pieces of cloth and rags being hung on trees beside the well as votive offerings, although this ceased at the end of the 17th century when the local priest filled the well with stones. The water was also used for baptisms in the nearby church of St Fillan, which now stands roofless beside Kilallan farm. The well gets a brief mention in Janet & Colin Bord’s work ‘Sacred Waters’. St Fillan’s Old Church at the east-side of Kilallan (Kilellan) Farm (NS 38268 68934) is now roofless but the walls you see here are still very sturdy and solid-looking. This building stands on the site of an older, medieval church, but there are still parts of this “older” building in the fabric of the walls. The doorway is said to date from 1635. In the churchyard wall there is a ancient baptismal font, or stoup, from the older church; and there used to be a 10th century stone standing inside the present edifice, but this seems to have been removed for safety reasons. In 1772 St Fillan’s was finally abandoned to the elemants. The British Listed Buildings site says of this: “Church ruin; roofless; walls and major part of gables remain; dated lintel “1635”. Later E gable, thick crowstepped W gable, with bipartite window at clerestory level. N wall with tomb of Fleming of Barochan family. Doorways in N and S walls. Moulded cornice to all but E. 3 doors to S blocked up. Stone stoup built into wall. Early gravestones in kirkyard.” Historic Scotland Building ID is:- no 12897. (See the link below*). 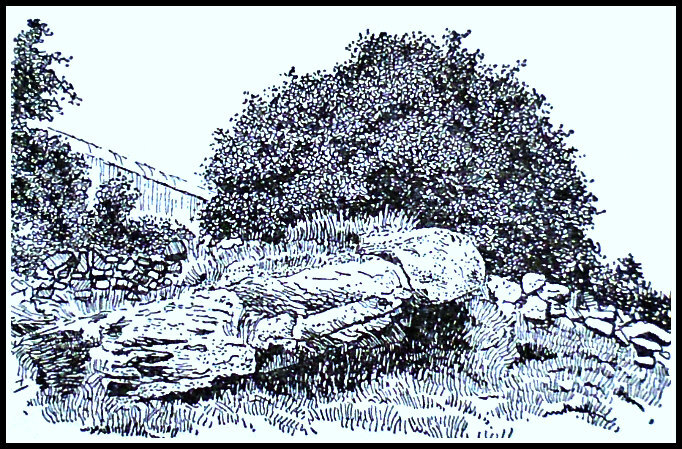 A little further to the south-east of the ruined chapel, beside the road and opposite the farm building, is a large flat rock of ancient origins that is locally called St Fillan’s Seat or Chair at (NS 38419 68937). Legend records that the holy man sat here and baptized the local children. We don’t, however, know a great deal about the life of the saint other than he was born in (c703) and was a monk at Cluain Moescna, Co. Westmeath, but in his youth (c717 AD) sailed from Ireland to Scotland and was accompanied by his mother, St Kentigerna, and his uncle, St Comgan. We know that Fillan buried his uncle on the Island of Iona. His father was said to have been Feriach. There are though another 14 saints called Fillan, Foelan and Faelan. At least two of these came to Scotland between the 6th and 8th century AD. This has undoubtedly led to confusion, but St Fillan of Kilallan was abbot of Glendochart, Perthshire, and died in 776 AD. His feastday is generally 9th January but sometimes 19th Jan, whereas the other St Fillan was a disciple of St Columba – probably at Pittenweem – in Fife. He died in 593 AD and is honoured on either 20th or 25th June. Attwater, Donald, A Dictionary Of Saints, Burns & Oates, London, 1958. Bord, Janet & Colin, Sacred Waters, Paladin, London, 1986. MacKillop, James, Dictionary Of Celtic Mythology, Oxford University Press, Oxford, 1998. The AA, Illustrated Road Book Of Scotland, The Automobile Association, London, 1963. © Ray Spencer, The Journal Of Antiquities, 2016. Categories: Ancient Churches / Chapels, Holy Site/Place of Pilgrimage, Holy Well | Tags: St Fillan's Holy Well And Chapel at Kilallan in Renfrewshire Scotland | Permalink.